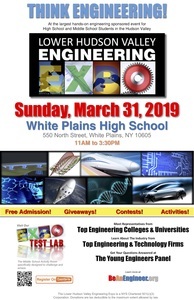 On Sunday, March 31st, the Lower Hudson Valley Engineering Expo will be at the White Plains High School in White Plains, NY (Westchester County), just off exit 8E of the Cross Westchester Expressway from 11:00 AM to 3:30 PM. Last year’s EXPO of universities and colleges, engineering and technology-based businesses and technical societies, as well as our popular EXPO Test Lab with elementary and middle school engineering-based activities, Rube Goldberg Contest, Robotics, Young Engineer’s Mentorship Panel, Women in Engineering Mentorship Panel, and Go-Pro raffle giveaways, was the best ever. With the present deficiency of employees in the Engineering fields and students choosing Engineering as a career, the effort to recruit more students into the fields of Engineering is greater than ever. The Expo is designed to support the imitative of educating high school and middle school students (and their parents) about Engineering as a career. In conjunction with enlightening students about careers in Engineering our participating colleges and universities inform juniors and seniors about the requirements for engineering degrees and provide information about admission and available curriculums. Our Young Engineer’s Mentorship Panels and Women in Engineering Mentorship Panels hold several sessions throughout the day where students and parents can ask questions like “What are the prerequisites for an engineering degree, what is it like being an engineer, what is your normal day like and how much money can you make being an Engineer”? Our Business presenters enlighten students and their parents about various careers in the Engineering fields as well as off-shoot careers that have a strong Engineering foundation. Our various business and industry presenters provide insight into their industries and how engineering is important within their organizations. Please visit our website www.BeAnEngineeer.org for more information.